I want to talk about the mental and emotional connection to thyroid issues, and the physical connection to why you may have a hypothyroid. If you look at people like Louise Hay and Inna Segal, they are amazing individuals who have been able to tie our mental and emotional connections to physical conditions. So many women who come to my programs have had kids, they’ve built business, they’ve got partners, they’re doing everything for their kids, doing everything for the business, doing everything for everyone else and not taking care of themselves. This creates a thyroid condition because the thyroid regulates metabolism. Then you put on weight and get a little bit fatter, and all of a sudden you have other self-image issues and it’s a downward spiral. From an energetic, mental and emotional side of things, it’s important you start taking care of yourself. Today or tomorrow – make a plan, do the things you love, show up for yourself, fill your own tank first before you go out and help everybody else in the world. The physical connection to hypothyroidism is directly related to radiation. The thyroid is where radiation gathers in the body, from flying on planes and getting x-rays to exposure to Wi-Fi, microwaves and other things around us. Another thing that accumulates in the thyroid is aluminium and mercury. Some people have mercury dental fillings, and they eat fish quite often (mercury accumulates in fish, shellfish and seafood). There’s potentially a lack of iodine and a nutritional deficiency. Iodine is the main component that gets rid of radiation and helps the thyroid function. How can you clean this stuff out? To get rid of heavy metals and toxicity, I recommend some type of cleansing. You can do this by using greens. 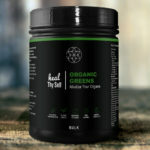 I have a product called Heal Thy Self Greens, which is alfalfa, barley grass and wheat grass. 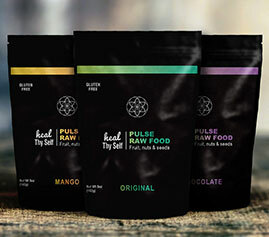 These actually cleanse heavy metals from the thyroid and prevent the uptake of more heavy metals, while also building your blood and giving you a vast variety of nutrition. Just simply putting a tablespoon in your water every day and drinking it will start that detoxification process. Then start to add in more fresh fruits and vegetables, specifically mushrooms, pineapple and seaweed. Seaweed specifically is high in iodine and B12, and helps to detoxify the thyroid and get your metabolism working better. Put it in a smoothie or snack on it, and this radically boosts thyroid function and improves your metabolism. If you have a major thyroid condition, I highly recommend you do a fasting program, either with me here in Bali at the Heal Thy Self Fast, or in my free online group called the Detox and Nourish program (formerly the Seven Day Cleanse Group). In here I give you a complete education on how to prepare for a fast, how to fast properly, and then how to break the fast. Whatever you’re ready for, take action, take a step in the right direction, and then really look at the mental and emotional connection and start really doing what it is you love.